Price Includes One Side Imprint. Light ink colors recommended. Second side imprint: Add $0.30 per piece. Additional color imprint: Add $0.30 per color, per imprint (4 spot color max., for 3-4 color imprint 25 piece minimum). NOTE: All prices, quantities, item numbers, sizes, brand name, pictures and/ or colors are subject to change without notice. NOTE: All dimensions given are approximate. White, Silver, Gold, Yellow 107, Baby Blue 292, Pink 211. Random samples: At chart price (above). Shipping charges will be additional. 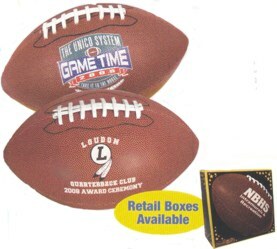 Unimprinted Footballs: FSSLFB $13.30 each, minimum order 8 pieces. WL-FSFB $30.50 each, minimum order 6 pieces. Shipping cost will be additional. Set up (screen/ plate/ die) Charge: Add $50.00 per design - per location. For foam footballs, click here. • Bright, bold imprinted messages help promote team spirit for schools and booster groups. Please provide black and white camera ready artwork to size (see "imprint area" to size the artwork accordingly). (No halftone artwork, no reverse copy; font size not less than 12 point). If you need artwork preparation, connect to the following link: Requirements to prepare and/ or to e-mail artwork to us, click here. FOB factory or warehouse. We will use our discretion as to the best method ( UPS or truck) to be used. Please call us for approximate freight charges when ordering. From receipt of complete order and approved artwork, please allow approximately 10-15 working days production time in the plant. 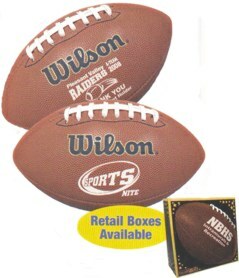 For Wilson footballs, please allow 3-4 week production. To place your order, click here. Then follow the instructions in the ordering form in each page, or call us at the telephone number shown at the end of each page to place your order. For your convenience, we accept Visa, Master Card and American Express credit cards. Order your imprinted rubber footballs Now! click here. How to order promotional products from us. Order your custom imprinted footballs NOW! To Email your artwork, purchasing orders, or inquires , click here.